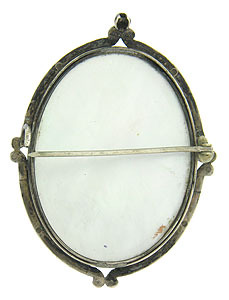 This antique portrait pin features a magnificent painting on mother of pearl. The Edwardian dressed lady leans against her horse. 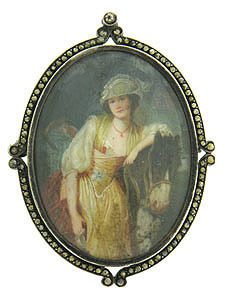 A simple curling frame adorned with marcasite surrounds the elegant portrait. Fashioned of sterling silver and finished with a simple pin back. The Art Deco pin measures 1 1/2" x 1 3/8". Circa: 1920.